The most common technique for catching these winter Salmon is to troll near the bottom in 100 to 130 feet of water. We use plastic squid, spoons, plugs or herring on 20 lb test rigs about 6 to 20 feet behind a downrigger ball. The downrigger is a temporary weight used to keep the lure down deep while trolling. The downrigger weight releases the line when a fish strikes and the fish is then played on the fishing pole to a hand held landing net along side the boat. We often use rubber landing nets to reduce stress on the fish in case it is released. Catching Winter Blackmouth is a staple winter time activity for Seattle Washington fishing charters operating in the Puget Sound region, much like winter Steelhead fishing. A lot of nice fish are caught on cold winter days. November, December and January are usually the best months for these hungry juveniles. Click HERE for more on WINTER BLACKMOUTH FISHING. 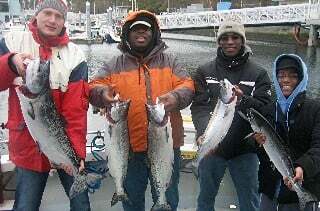 From October through April our Seattle Washington fishing charters can access this great winter Salmon fishery on Puget Sound for juvenile King salmon that locals call Blackmouth. These fish range from little trout sized kids up to 20 pounds and the average keeper of around 5 to 7 lbs will vary through the winter. 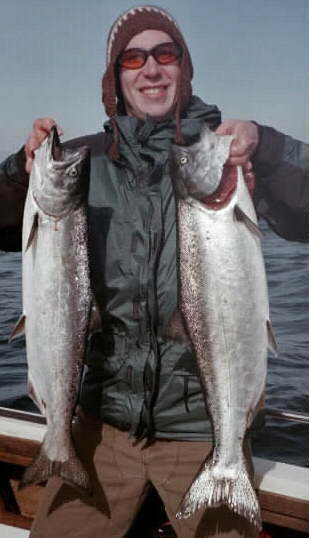 Minimum size for these juvenile Chinook salmon is 22 inches and the average keeper is probably 25 or 26 inches. Though many of the fish landed may be under the 22' size limit, some will top 33 inches in length.